In 1904 at Launceston Gus again won both world titles. Later in 1904 Gus toured New Zealand and, at Eltham, he won the 2 foot Standing Block Championship of New Zealand. Back in Australia Gus went to Western Australia and won both standing block and underhand championships. 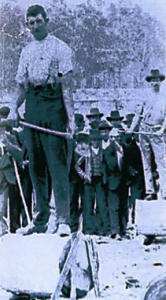 In 1906 Gus won the Australian 6ft girth Underhand Championship in 1 min. 56 secs. Gus Blanc was a very good all round sportsman, playing football and tennis as well as woodchopping. At one sports carnival Gus won both the 18inch standing block, 20 inch underhand, then went on to win both the 75 yards and 100 yards sprint, high jump and long jump. 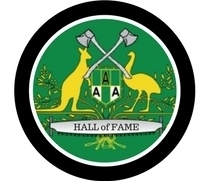 For many years Gus was handicapper of the Yarram branch of the South and Central Gippsland Axemen’s Assoc. In 1950, now retired, he was honoured for 50 years of axemanship. Over many years Gus also shared his knowledge and trained many locals.